For a few years now, I have been playing around with using alternative processes in the creation of images. Most of this has involved using the instant (Polaroid) medium in various ways such as shooting with expired film of different grades, or using the finished photo to make emulsion lifts or transfers. But I have also been experimenting with photograms, which is essentially a way to describe any photographic image that has been produced without a camera. They are usually made by placing objects directly onto the emulsified paper under direct light, and then processing the result in chemicals, like a normal print. There is no negative or traditional enlargement required—though it can be incorporated—and there are a myriad of avenues for experimentation. This is one of the reasons I had always wanted my own darkroom to begin with. The opportunity to play. 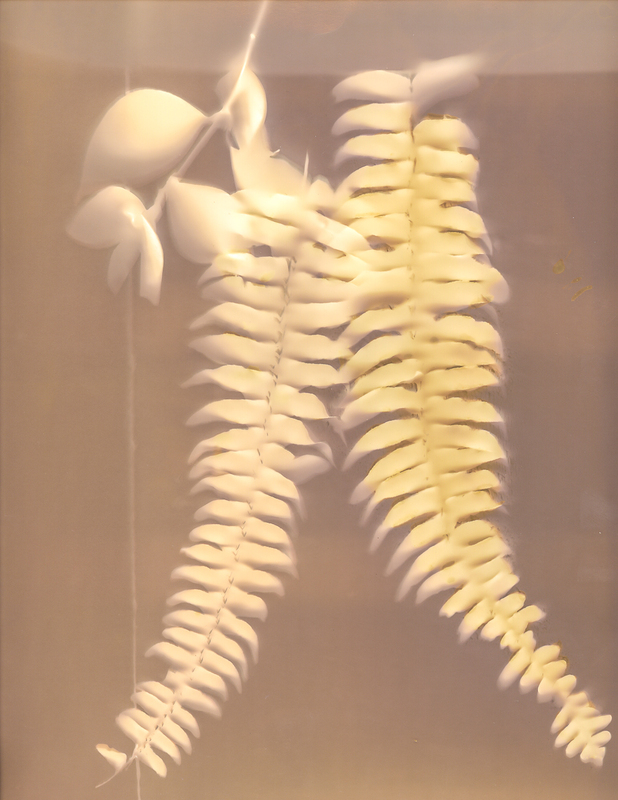 Photograms are as old as the craft of photography itself. William Henry Fox Talbot, considered one of the medium’s founding fathers, was exposing flowers on sensitized materials in the 1830’s. The visual artist and photographer Man Ray created a unique process of making photograms in the early 1920’s. He called them “Rayographs” and later, his technique was introduced by Laszlo Moholy-Nagy to the German Bauhaus of the 1930’s. I have been most interested in a process which eliminates the use of developer completely and takes place not in the darkroom but outside, in natural light. Prints made under the sun. The late Jerry Burchfield made famous this process, which he called Lumen Prints. He created amazing images of Amazonian flora while working in the field, and would expose his subjects for anywhere between 30 minutes to several days. He would then put them in a light-proof box and finish the process later, after he got home. Finishing the process involves skipping the typical developer and stop bath chemicals used to make normal prints, and simply soaking the exposed paper in fixer. (For those unfamiliar, the last step in making a traditional analog print is to seal the silver halide onto the paper by putting it into a bath of “fixer”) This brings out surprising and unexpected colors, beautiful pastel shades of pinks, yellows, browns, and more. Burchfield’s work is remarkable, and I suggest you check them out for some excellent examples of how cool a photogram can be. I have been trying out this process on a fairly regular basis over the past couple of years. My own experiments haven’t come near to approaching any perfection of the process, though I’ve had some compelling results. I have used flowers, foliage and sometimes solid objects, such as a hammer from my studio. I’ve done several dozen lumens with some variant utilization of the American flag, for a specific piece I’ve been thinking about. It’s a project for which I have no completion date, as of yet. I usually assume I’ll kind of know it when I see it. These is how my set-up looked this afternoon, around 12:30pm, when the sun was high in the sky. A few of the finished results are featured below. My basic process for creating lumen prints goes like this: I lay out my desired subjects on top of the paper and inside a darkroom tray. I place a piece of glass over the top. I put it out in the sun, for the desired amount of time. Eventually, I bring the papers inside and keep them in a dark cabinet until I have time to give them a fixer bath, and then I rinse and dry them. That’s pretty much it. The quality and nature of the image that emerges involves a great number of variables, including the intensity and duration of the exposure to the sun, the addition of other properties to the tray like water or oil, the humidity and temperature. Also, a huge factor is the type and age of the paper used. Different brands give a different sort of effect and color palette. Not only is old expired photo paper usable for these prints, I have found it to be desirable. A lot of my experimentation has been dictated, in fact, by the availability and affordability of old and expired paper on eBay. You’d be surprised how much people are making by selling expired photo paper these days. Supply and demand. A dearth of public or private analog darkrooms means a relative rarity of practitioners, and this fact alone has made old school photography and its attendant alternative processes popular among artists and the intrepid. Though there are several companies still making supplies and several more new boutique companies that have popped up to fill the needs of a relatively small market, a lot of retro brands of film and paper are either nearly or completely obsolete. 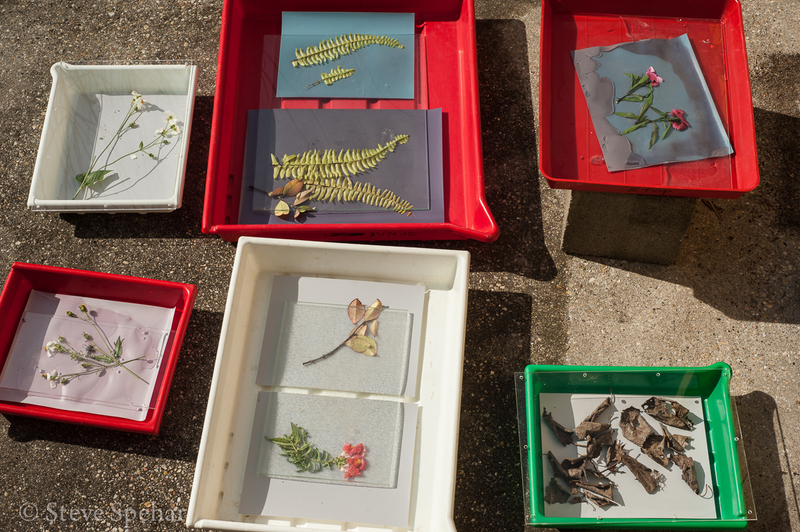 This afternoon I set up several trays in the backyard, containing flowers, foliage and dead leaves. I split them into 3 time-length batches: 90 minutes, 2.5 hours and 4 hours. I used different kinds of fiber-based photo paper, and in a few of the trays I added water. As I write this, I’m preparing to head into the darkroom and apply a fixer and a rinse bath. Then I have to let them dry, and after that I will scan them and post them here for you to see. “Fern #1” Created on 12/11/2014. 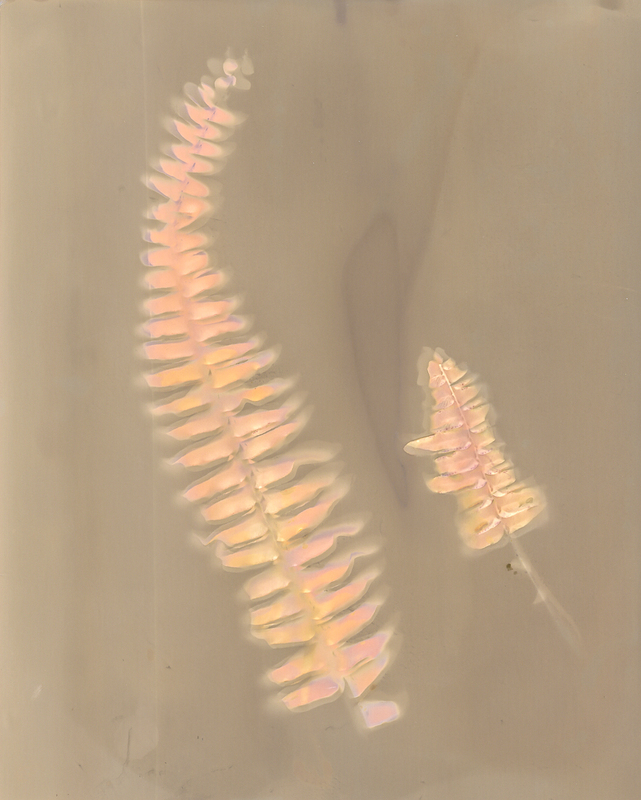 Format: Fern leaves on Oriental Seagull VC-FBII glossy fiber paper, 4.5 hours sun exposed. “Dandelions” 12/11/2014. 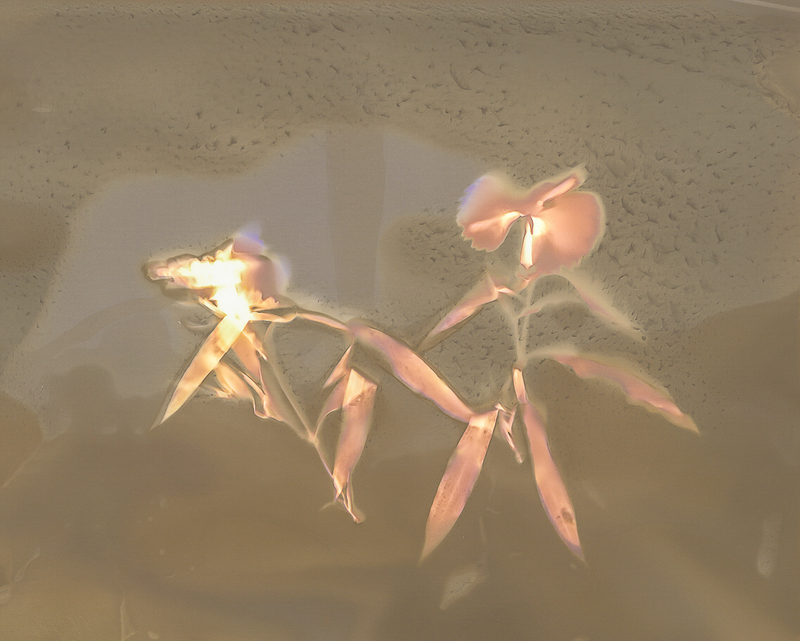 Format: Dandelions and water on expired Orient. Seagull Warm Tone fiber paper, 4.5 hours sun exposed. “Dianthus” 12/11/2014. Format: Dianthus flowers and water on Orient. Seagull VC-FBII glossy fiber paper, 90 min. sun exposed. “Ferns #2” 12/11/2014. 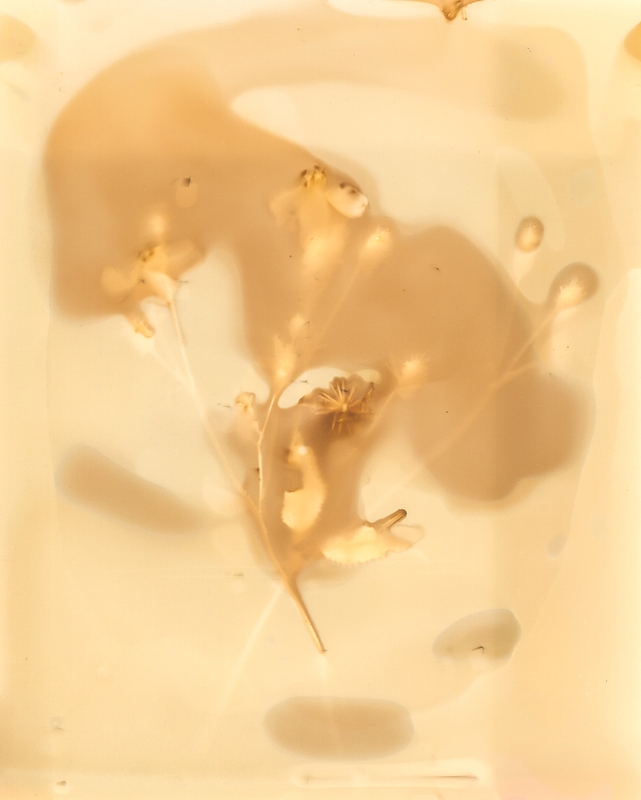 Format: Fern and jasmine leaves on expired Unicolor Exhibition baryta paper, 90 min. sun exposed. All four of these scans have been lightly enhanced with editing software in order to make them pop a little better off the monitor. Otherwise, nothing extraordinary came of today’s experiments. These were the best ones—the five others were very light and uninteresting. None of the paper I used gave me particularly great results. At some point I will go online and hustle up some of the stuff I’ve found to be more compelling, like old expired Forte or Ilford paper. Anyway, it’s all about the quest. I’m in no particular hurry to master the process, just keep discovering. If you’d like to check out more of my results from making lumens, you can see them here. If you are interested in learning more about photograms and other alternative photographic techniques, I recommend a great resource, the Experimental Photography Workbook by Christina Z. Anderson. A great source online for buying photo chemicals and other analog supplies is Freestyle Photo. Though an actual darkroom isn’t required for the process of making lumen prints, you should at least be familiar with the chemicals used in the darkroom process. If not, please educate yourself on the safety precautions in regards to handling, using and disposing of them, and working in a properly ventilated space.